The patented Aluminum poly fastener developed by John Pound, president and founder of Agra Tech, is for attaching polyethylene or shade fabrics for all greenhouses. Features double Aluminum Agra Lock extrusions on a sturdy 3 1/2" base with the strength to span 6' or more. Use at the eave or wall to splice poly or join the roof with an opening wall. 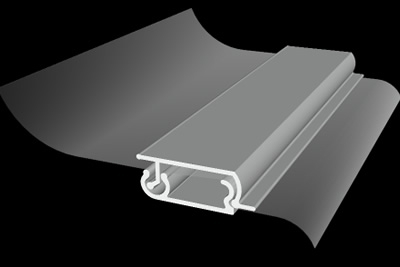 A double Aluminum Agra Lock extrusion to splice roof poly on long houses or on end arches to make the transition from roof poly to poly end wall. Agra splice must be attached every 12" on center to an arch or other continuous piece. Provides a transition from poly roof to rigid glazed gable end walls. Agra Lock extrusion holds the roof poly and there is a niche for the gable glazing. Gable extrusion can be arched and punched for your house or in straight pieces. If you are purchasing gable extrusion for a non-Agra Tech arched house please provide the length and rise of the arc.